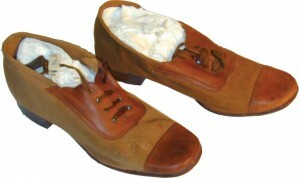 A pair of barrack shoes with an 1899 contract stamp. Courtesy Quartermaster Museum. 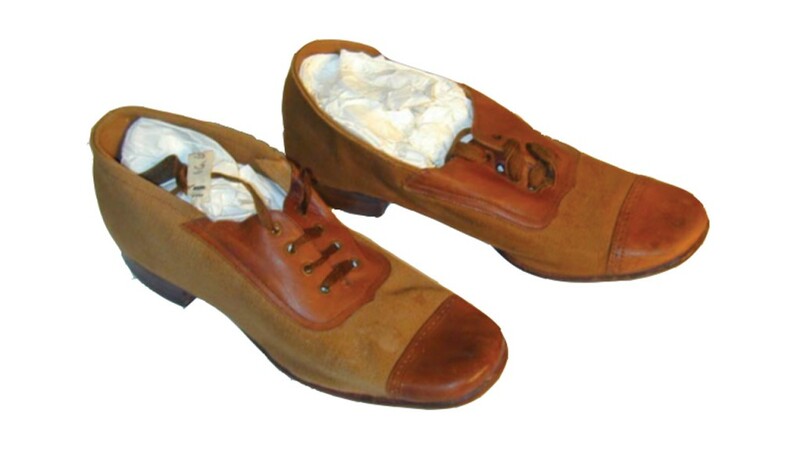 The first footwear issued during the Revolutionary War were low quarter leather shoes, but, even with the addition of overlapping gaiters, rocks often slipped in and caused injuries. In 1821, higher laced “bootees,” rising four inches above the ankle, were introduced. Then in 1851, shoes were issued for the first time with distinct lefts and rights. Even with this slow evolution in design, the issued shoe had to serve all purposes for a Soldier, from dress parade to standing guard in the snow, and from long marches on campaign to evenings in the barracks. During the 1880s, the Army reconsidered the design of enlisted footwear, and, for the first time, created specialized shoes for various uses. A post shoe was introduced for wear on garrison and two different designs for field shoes were intended for Soldiers marching on campaign. For cold or wet weather, rubber Arctic overshoes were added. The final addition to the new line of Army footwear was a shoe to be worn during leisure time in the barracks. In April 1886, the Secretary of War authorized the initial purchase of five thousand pairs of “barrack shoes” for trial. Made of canvas with a leather toe covering and heel support, the barrack shoes were stylish for the period, lightweight and more comfortable. While intended for indoor wear only, the new shoes proved so popular that officers were soon reprimanding Soldiers for attempting to wear them in formation or during work about post. The design eventually gave way to the Army’s first gymnasium or gym shoe introduced in 1905. The introduction of the humble barrack shoe is just one example of many improvements being made to Army clothing during this period, an indication of a larger trend. By the late nineteenth century, leaders recognized the importance of recruiting and keeping a committed professional enlisted corps. Over the next several decades, they made significant investments in training, post amenities, and improvements to the Soldier’s clothing – such as the barrack shoe – in an effort to keep quality personnel, signaling the beginning of a new era of professionalism for the U.S. Army. 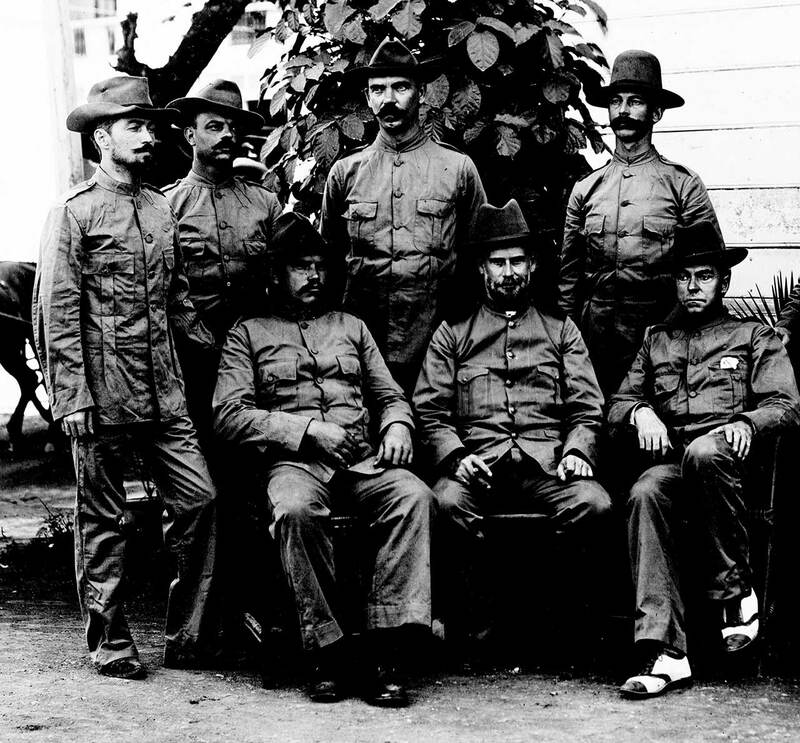 One Signal Corps Soldier (seated at far right) is shown wearing his barrack shoes outdoors in this photograph taken in the Philippines in 1899. Courtesy National Archives.